Nuevo Vallarta residents who live at Villa La Estancia really do have the best of both worlds. They have an incredible high quality home with the best amenities and services around. Surrounded by lush landscaping and endless Banderas Bay views, life at Villa La Estancia is pretty ideal. One great thing about living in Villa La Estancia in Riviera Nayarit is that you can easily head to Puerto Vallarta for the day if you are in the mood for some added excitement. Are you an art lover and always interested in seeing what is new and fresh? 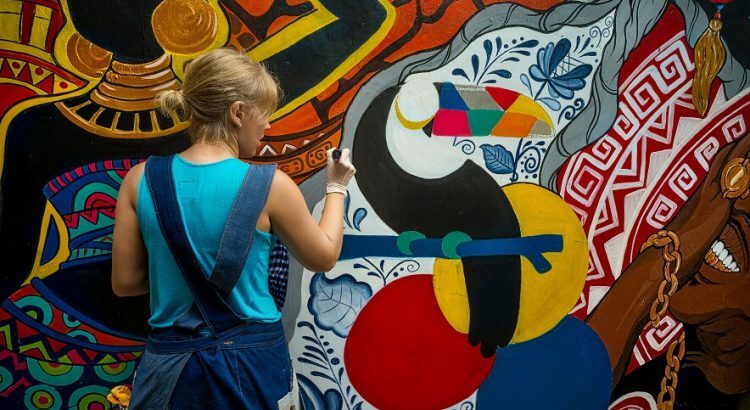 If you, you probably already know that Puerto Vallarta has a thriving and interesting art scene that is seeing major growth in recent years. There are lots of upscale art galleries in the downtown art district that are worth a visit. However, did you know that Puerto Vallarta also has beautiful urban graffiti street art that you should definitely check out? Street art is a modern take on what some people view as art. Have you not seen any of the cool street area around town? If not, sign up today for the PV Street Art Stroll that will happen on March 2nd. The event was organized by local art lovers in order to showcase the beautiful murals and street art in the area. Puerto Vallarta is best known as a charming small town that has grown into a modern mix of old and new that is easy to fall in love with. Anyone who walks along the quaint cobblestone streets will start to feel the undeniable magic of Puerto Vallarta. While there are modern developments under construction on many street corners, Old Town is still able to maintain that friendly, small town vibe that we all know and love. With tons of great shops, bars and restaurants in the area, incredible street art is also found in PV and you may not have even known it was there. Have you seen any of the street art for yourself? If not, leave Villa La Estancia for the day and join the PV Street Art Stroll on March 2nd so you too can see the coolest, most colorful street art in the region. Remember, street art is constantly changing so that impressive mural you see today may be gone tomorrow don’t miss out! Local residents decided to organize the PV Street Art Stroll to share the incredible street art with visitors and other PV residents. They were able to identify the most efficient and best route to find great street area in the downtown and Old Town areas. On March 2nd at 10 am, attendees will meet up at the main church right off the central plaza, called the Lady of Guadalupe Church. From there, the PV Street Art Stroll will begin its path to view impressive murals around town. The walk will probably last about 2 hours, so make sure to wear comfortable clothes and shoes, and bring along a hat and water, too. Definitely don’t forget your camera so you can take some memorable shots of your favorite street art masterpieces. PV Street art could be here one day, and then gone the next so take it all in as you are literally capturing a moment in time. What a beautiful gift! Are you ready to leave your oasis at Villa La Estancia in Riviera Nayarit for the day, and head PV for the PV Street Art Stroll? The group is limited to only 18 people so visit www.pvstreetart.com right away to secure your spot. Hope to see you there!